Earlier this year, we released IBM Connections 4.5. 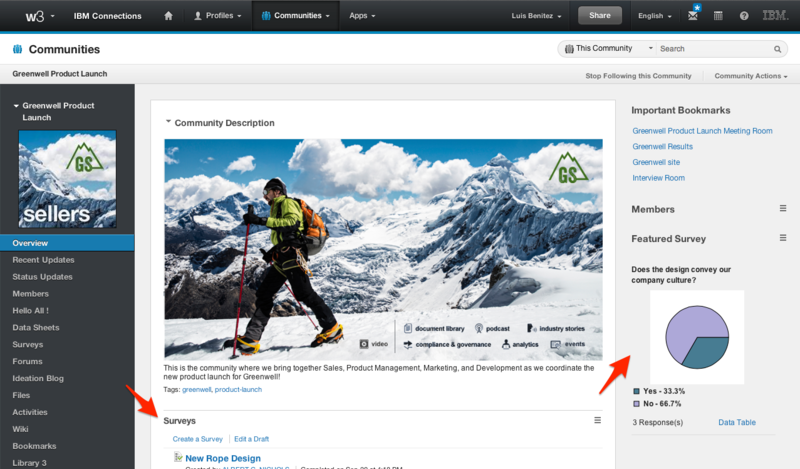 The big focus of IBM Connections 4.5 is the new Content Manager add-on which brings the power of content management and combines it with the power of the IBM Connections social platform. The add-on is part of the core IBM Connections installer so there's nothing else to install! Combines the ease of use of social tools with the power of a structured hierarchy. Includes document check-in and check-out, version control, approval routing, metadata, taxonomy, document types and nested folders. Makes content management tools as easy to use as social networking tools. This add-on also allows Quickr customers to upgrade to a better experience. To facilitate this transition, we've provided a migration tool to our customers at no extra cost (as you can see in slide 18 below). This allows them to take their libraries from Quickr Domino or Quickr for Portal and migrate them to IBM Connections Content Edition. We've also made a RedBook available: Making the move to IBM Connections 4.5 and IBM Connections Content Manager. To download the migration tool for Quickr for Portal, click here. The documentation for the tool is here in our public wiki so you can start seeing how it's going to work. If you are interested in getting access send me a note and we'll get you going! Hot off the presses! One of the most popular plug-ins for IBM Connections, IBM's Enterprise Social Network, is the Desktop plug-in for Microsoft Windows. This plug-in gives you quick access to all your files directly from Windows Explorer and Microsoft Office. In the latest release, of the plugin we've added the following new languages: Croatian, Romanian, Slovak, and Bulgarian. Additionally, we've also now enabled the plug-in so that administrators can customize the branding of it. For example, if you have deployed IBM Connections and you are calling it "ConnectTED" internally, you can now make sure that the plug-in obeys this branding. To learn how to customize the plug-in for your users, check out the documentation here. To download the plug-in, go out and get it from the IBM Connections App Catalog here. Then, Erik Brynjolfsson, Director of the MIT Center for Digital Business and co-author with Andrew McAfee of Race Against the Machine, did a keynote with his take on how today's technologies are transforming the way we do work. In his keynote, he argued that it's not about inventing new technologies but inventing better ways to work with them. I can definitely validate that if it wasn't for the social solution that I use every day, IBM Connections, I wouldn't be as productive as (believe) I am being a mobile employee for one of the largest companies in the world. It gives me the right capabilities to remove obstacles and barriers, and just move business forward ! Time and time again, I continue to find examples of how productivity increases by leveraging these new tools. That's what makes me passionate about doing what I do at work. I want everyone to benefit from a social business transformation!! If you missed the event (and my mobile demo from my iPad), you can catch the replay here: http://ibm.co/reinventwork. And to continue the conversation, tomorrow, I'll be participating in a Twitter chat so if you want to participate, you can get all the details here. See you tomorrow in the Twitter chat! Yesterday, we made a video tutorial available to walk admins through the process of customizing the out of the box IBM Connections Reports. Out of the box, IBM Connections provides over 100 reports for admins and community managers to monitor adoption and figure out the content that's working so they can focus their energies in the right place. The data in these reports can be aggregated in several formats such as by date, by geography, by department, etc. Sometimes, there's data or dimensions that specific community managers want to see. When we built out the reporting mechanism, we had this in mind and made it extensible. It takes just a few steps to take the reports to the next level! To learn more about customizing the IBM Connections reports, click here. Watch out: We are updating IBM SmartCloud Connections. Say hello to File Sync! We have started the process to upgrade our cloud deployment of IBM Connections, IBM's Enterprise Social Network. As announced here last week, we are updating our social business offerings and this quarter's release will be the biggest release ever! Interested to learn more? The first step is to register for our webinar in 2 weeks (see link below). While there's tons of new features and capabilities that we are deploying over the next few days, I wanted to briefly call out our new file synchronization capabilities. As you may recall, Forrester cited IBM Connections as a Leader in File Sync and Share. For some time now, you've been able to download files, store them offline, edit them, and then manually re-upload them back to the server. It was time to automate this whole process. With File Sync, you can now travel stress free knowing that all your files are automatically sync'ed to your mobile device and that you always have the latest and greatest version of that very important presentation. To walk you through all the great new features and watch demos of our new capabilities (spoiler alert: I'll be doing one of the demos), please make sure that you attend the following webinar. It will be on September 18th and that's where we'll go into more details about this amazing new release. Workers are more dissatisfied and less engaged than ever before. But did you know that using social technology can increase efficiency by up to 25%? (source: McKinsey) . Additionally, 69% of employers believe employees are engaged, while only 34% of employees claim to be. (source: Kenexa blog) Since people now determine your success or failure, it's time to use social to rethink how work works.